FFK, Orji Uzor Kalu, Suswam, Olisa Metuh, Dasuki, make list of 50 prominent Nigerians banned from traveling - SWANKYLOADED OFFICIAL BLOG. A former National Security Adviser, Colonel Sambo Dasuki (rtd), 13 former governors and seven ex- ministers are among the 50 prominent Nigerians that have been banned from traveling following the order from President Buhari for the full implementation of the Executive Order 6 (EO6). 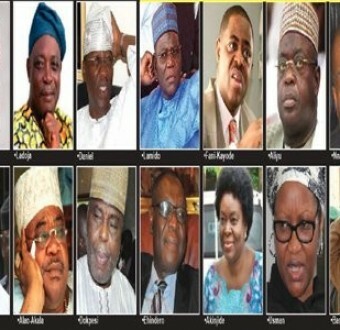 The Nation reports that others on the watchlist are: ex-governors Saminu Turaki (Jigawa), Murtala Nyako (Adamawa), Adebayo Alao-Akala (Oyo), Gabriel Suswam (Benue), Rasheed Ladoja (Oyo), Orji Uzor Kalu (Abia), Danjuma Goje (Gombe), Attahiru Bafarawa (Sokoto), Muazu Babangida Aliyu (Niger); Chimaroke Nnamani (Enugu); Sule Lamido (Jigawa); Gbenga Daniel (Ogun); and Ibrahim Shehu Shema (Katsina). The ex-ministers are Nenadi Usman, Bashir Yuguda, Jumoke Akinjide; Bala Mohammed; Abba Moro; Femi Fani-Kayode; and Ahmadu Fintiri. Also on the list are a former National Publicity Secretary of Peoples Democratic Party (PDP), Olisa Metuh; Chief Jide Omokore; Ricky Tarfa; and Dele Belgore (SAN). Most of the affected persons are currently facing trial for alleged corrupt practices in different courts. The list was generated from cases and proceedings filed by the Economic and Financial Crimes Commission (EFCC), the Independent Corrupt Practices and Other Related Offences Commission (ICPC), the Nigeria Police, and 17 other agencies. The document indicated that many of those affected had earlier been placed on similar legal restrictions by the courts and security agencies including restriction of movement, seizure of passport, temporary forfeiture of assets, freezing of accounts and others. Explaining the ban on the prominent Nigerians, a top government official, who spoke in confidence, said there is no cause for alarm.